Pet owners consider their fur babies to be an important part of their families. The old vision of dogs tied next to their dog houses no longer exists as people actively bring their pets with them to run errands, shop, vacation and more. Considering 68 percent of U.S. households have a pet with 60.2 million of those households owning a dog, from a business perspective, it makes sense to offer dog-friendly services. In the restaurant industry, adding a pet-friendly patio brings many advantages. Restaurants with dog-friendly patios are likely to draw in specific consumer segments. Most pet owners will not leave Fido or Fluffy in the car while they go out for a meal, they’ll either turn to a dog-friendly competitor or make a quick run to a take-out eatery. However, pet owners out shopping in retail stores that allow leashed dogs will be more inclined to stop and have lunch or dinner if they see a pet-friendly restaurant during their outing, especially one that offers a bowl of water or has a pet menu (another revenue source!) Not to mention, chances are these consumers will remember restaurants allowing their dog to join them to eat and, as a result, become loyal customers. While not everyone is a dog lover, those who do have an affinity are likely to take notice of dogs in their vicinity. Individuals and/or parents with their children walking by restaurants with dog patios are likely to stop and admire, ask the owner if their child can pet his or her dog, or just stop to chat with dog owners. Many passersby may even impulsively stop to eat. Dog-friendly restaurants have the opportunity to create a fun atmosphere while simultaneously driving additional revenue from foot traffic that they may have missed out on. Welcoming dogs to a restaurant adds a unique marketing opportunity for restaurants. For instance, consider the fun and eye-catching posts that can be made on Facebook, Twitter, Instagram, the company blog or other preferred online social network. Not to mention those posts made by dog-owning customers who dine in the restaurant. According to a study conducted in 2017, adult dog owners talked about or posted a photo of their dog on social media six times a week. Imagine the free publicity when these owners share photos and talk about pet-friendly establishments. Marketing doesn’t get better than this – it’s positive, widespread and doesn’t even put a dent in an often limited advertising budget. Consider those widely shared social media posts or even simple word of mouth. Pet owners who learn through friends, family and online connections which restaurants offer dog-friendly patios are likely to stop in with their own pooch and/or share the information in their social circles. Dog owners tend to stick together, and businesses that are branded as being pet-friendly benefit from dog owners sharing their information. Many of today’s pet owners, especially millennials, consider their fur babies to be legitimate members of their families. Restaurants taking their pets into consideration can tap into a huge market. While there are some potential drawbacks to welcoming dogs in a restaurant, if planned strategically, it can easily work. 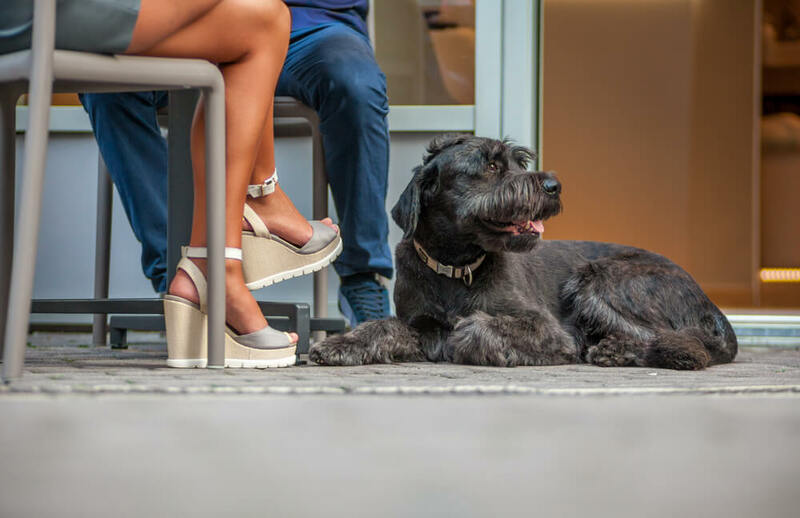 For customers preferring to eat their meals without Fido looking over their shoulders, restaurants can offer a pet-free patio section to co-exist with their pet-friendly one. Adapting existing outdoor space to include a dog-friendly patio is a smart strategy and restaurants that make the investment quickly realize the financial benefits. Wondering who in your area is dog friendly, we’ve got you (and Fido) covered!